Whether you "Run with the Pack' or "Roam Alone", Timberwolf Camps is the place you want to be. 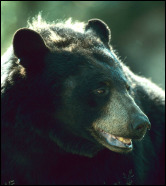 With over 12 years experience in bear baiting and moose hunting, we know your hunt will be successful.​​ Book Today! For secluded hunting and fishing we offer affordable Ontario fishing lodges and hunting cabins to make your adventure a comfortable one. We offer three locations with multiple cabins to choose from: The Main Camp, Dumas Lake Camp and Treptow Lake Camp. Our house keeping cabins include: a stove and refrigerator, pots and pans, flush toilets and a men's/women's shower. You will need to provide sleeping bags, linen for shower and kitchen, boat cushions, life jackets, paper products and of course food. To see more suggestions for your stay check out our helpful resources page.